1. 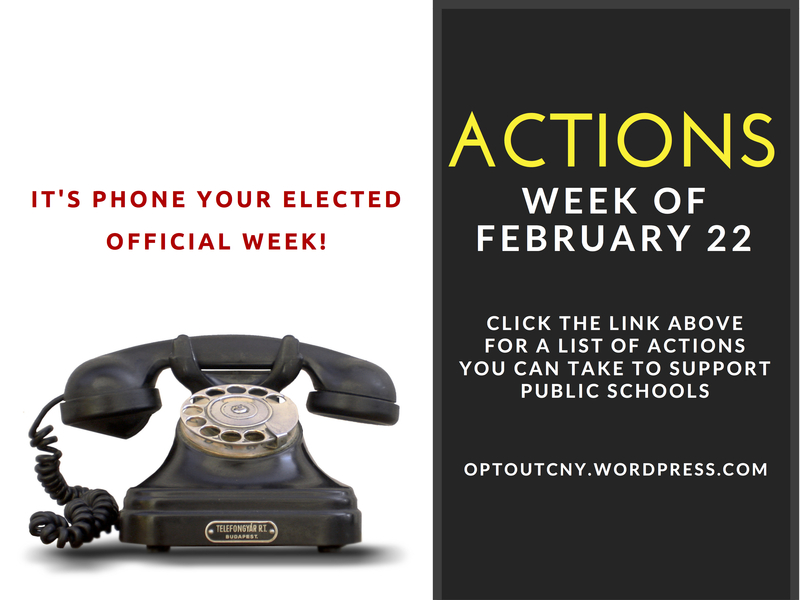 It’s phone your elected official week! It is time to make your voice heard as you speak up and speak out for our students and the public schools that serve them. Everything you need to get started is right here. Step 3: Make the phone call! Click above to see & hear a phone call! That’s it! Less than a minute of your time, and you will send a huge message to your elected officials in Albany. 2. Submit your refusal letter! Visit our main page for links to refusal letters. Download, edit to meet your needs, and submit to the teacher and principal. 3. Invite a friend, colleague, neighbor of family member to join Opt Out CNY. -New members are always welcome to join our group. We gather on Facebook here. 4. Add your name to our database & start networking. 5. Ask your teachers association to pass the resolution to support the “I Refuse” Movement. -Adopting the resolution shows that local unions pledge to oppose high stakes testing. Read more here. 6. Schedule & attend a test refusal “how to” session in your community. -Choose a date and secure a location. Opt Out CNY will provide you with materials and/or a speaker to present the facts about test refusal. -Check out our CALENDAR of EVENTS. 9. Contact Us for a lawn sign or car sticker! Sure the ground is frozen, but our refuse the test lawn signs look great in the snowbank in front of your home and even better on the dashboard of your car window when you’re parked at the store. Want to do double duty? We’ve got stickers for your car, too. Contact Opt Out CNY to request your lawn sign and car sticker! 10. Download this side by side. Take a peek at this “Framework for Test Refusal” and help others understand what test refusal is not. Many are under the false impression that test refusal will harm a teacher’s evaluation when in fact, the opposite is true. Refusing the test is the only way to be certain your child won’t negatively impact a teacher’s evaluation. This is because a “growth model” is used to determine a teacher’s rating based on state test scores. This 7minute video from engageNY is helpful in understanding the growth model. 12. Network, Read, Learn, Share! Check out what’s happening in other groups. We have allies everywhere!